While Halloween is on this night that we anticipate our streets being filled with all sorts of creatures and characters; it is not the only night of the year we can enjoy the undead. . 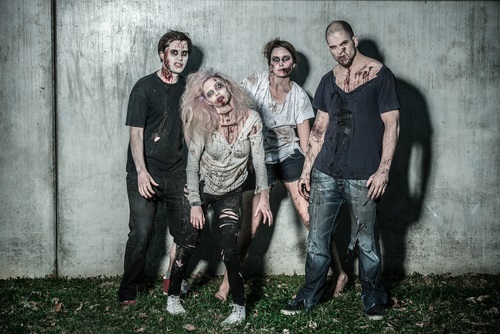 If zombies are something you truly enjoy there are plenty of ways you can do so year round. For instance, you may want to watch them on television or in a movie. You can even choose to hold parties through the year that require those who attend to come as their undead selves. You may even decide that you want zombies to be in your hands, if this is the case then check out the top zombie books. Hollywood knows how to make an impact in any genre of film and television. This includes the horror genre and specifically all things undead. Whether you want to watch zombies on a weekly basis or prefer one long encounter there are plenty of options available to enjoy. For those who would like a weekly encounter the currently popular television show The Walking Dead on AMC is a destination you should consider checking out, if you don’t already. For those who may have heard of the show, but are not all the familiar with it here is a little background information to get you started. The series is based on a comic book series of the same title. It tells the story of a small group of survivors trying to survive after a zombie apocalypse. It will be returning for season 3 on AMC at 9pm on Sunday, February 9th. Zombies may have only invaded the small screen in the last three years. However, they have much more well-known presence on the large screen. Whether you are looking for a classic to enjoy during a stormy night or something to entertain your friends and family with during your Halloween party, you may want to check out World War Z, the Cemetery Man or the first remake of the classic Night of the Living Dead among others. Themed parties can reflect anything during the year from the season to an interest of the person throwing it, including zombies. If you feel like dressing like the undead invite your friends over for a movie night or just a get together with the theme of the evening being zombies. To make things a little more interesting you may even want to have all of your guests dress like a zombie. Parties, movies and television shows are a great way to enjoy your interests. Sometimes though you may just want to relax from a long day and curl up with a good book. Fans of all things undead may want to check out some of the top zombie books that are sure to keep you entertained. Exploring all things undead is an interesting way to let your mind get creative while you hang on for the ride. Choose your medium and be prepared to enter a world of science fiction and horror!